A third of all consumers now shop online at least once a week. With this in mind, it’s essential that the shopping experience is as straightforward as possible for your customers. This includes considering how easy it is to order from your website and the physical process your customers have to go through to return a product should they need to, which is where integrated labels come in. If you are a business owner, integrated labels and a managed print service could save you time, money and allow you to focus on other areas of your business. The most recent survey carried out by Harris Poll revealed that 90% of customers stated free delivery as the number 1 incentive to do more shopping online, whilst 69% of people surveyed listed that one-day delivery was a big incentive to shop online more and 68% listing free returns and exchanges. There are an increasing number of businesses who are offering free returns, so if you’re looking to keep up with the competition, this is certainly something to consider offering customers. Moreover, 91% of people surveyed said that an easy returns process was significant in their desire to purchase. Read our blog about the Importance of a Good Returns Policy here. Ordering the product online: whatever the device your customer is using, this needs to be simple. Forms Plus have designed a user-friendly and fully optimised website with a view to making it easy for our customers to order the stock they need. We’ve always aimed to stay one step ahead of the game, having also fully optimised our site for mobile use, as more users now browse on their smartphones and devices than on a computer. Returns: consider the physical process your customer has to go through to return a product should they need to. So, we know that returns are ever more important for customers in 2017, but how can you go about this? No one wants to be dealing with lots of complex paperwork in order to send something back, this is where integrated labels come in, as they amalgamate several labels into a single form which simplifies the physical process for customers. Your customers will have one combined document doing the work of several and from the sender’s side of things, the likelihood of operational errors is considerably reduced because all components are on a single form, allowing them to offer a better service. You can read more about integrated labels and despatch forms here. Customers are increasingly seeking free delivery and many businesses are reluctant to offer this. Offering free delivery and returns could be a great way to attract attention to your business and set you apart. Watch this space for our blog on ‘Free Delivery and Returns,: Do Customers Now Expect It?‘, where there will be more detailed information surrounding this. Here at Forms Plus we offer a next day delivery service as standard but we can also upgrade to a before 10am or 12am service if necessary. Saturday’s are also available as a delivery option. Extra tip – why not use treble integrated labels to promote an offer you’ve got running? Or to encourage your customers to make future purchases? Integrated labels are fully compatible with leading ecommerce platforms such as eBay and Amazon. Investing time into making things easier for your customers is much easier when you have facilitated your own printing needs. 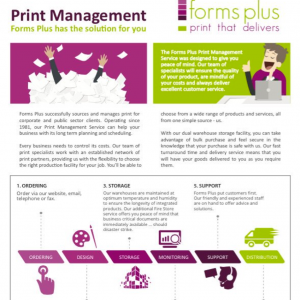 Forms Plus offer a comprehensive print management service, taking the stress out of your hands and allowing you to focus on other areas of your business. An effective and easy-to-use website. A type of despatch label that makes returns and sending easy for the customer and for your business. Offering delivery options that your competitors do not. If you would like more information about our products and services here at Forms Plus, please do not hesitate to contact us.